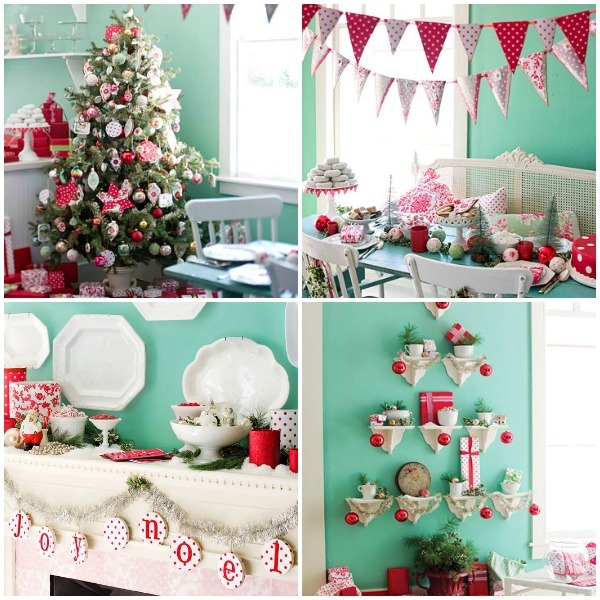 When it’s about Christmas, you should decorate every nook and corner of the house with the same enthusiasm, and that includes kitchen as well. 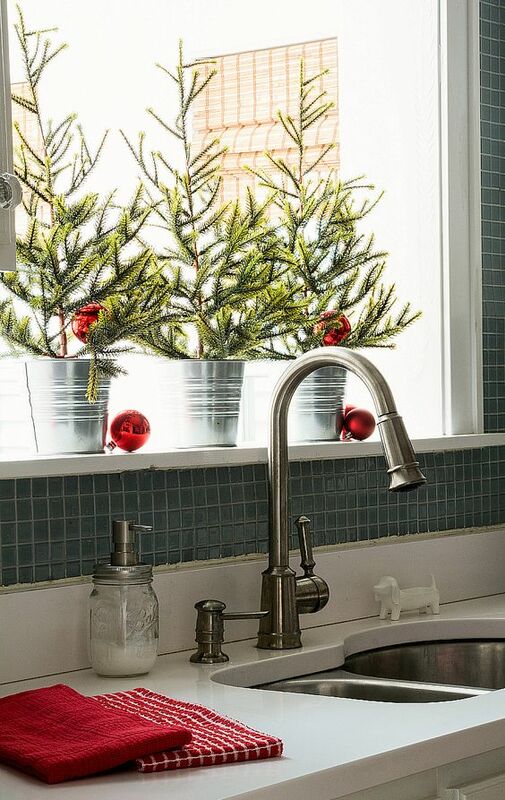 But sorry to burst your bubble, decorating the kitchen isn’t as easy as you think it can be. Options are very limited in decorating this part of the house. Let’s share a few pointers with you. 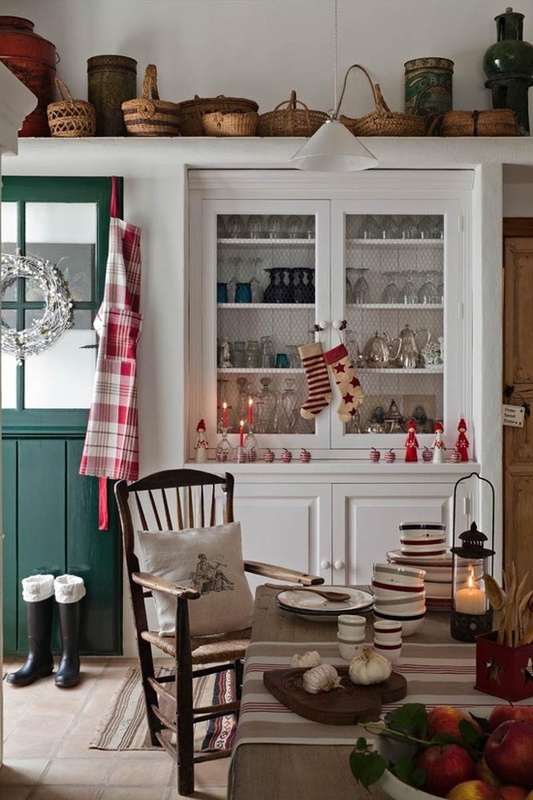 If you want to decorate the kitchen in a traditional way, pick red and green accessories and tableware, hang a wreath and do some window decoration. 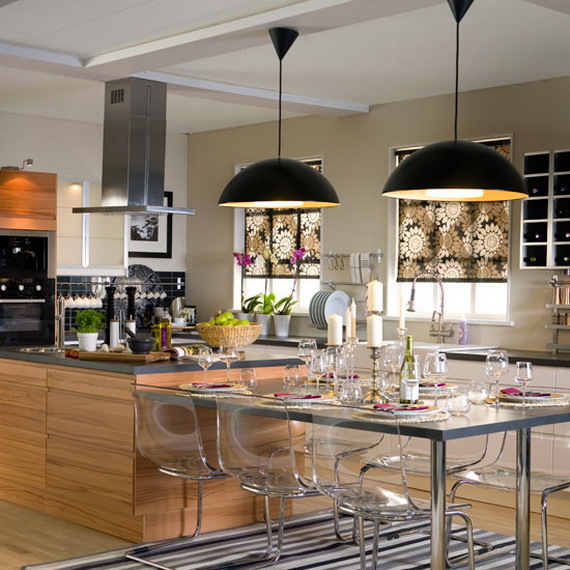 If you want to keep it minimal or modern, then pay attention to another corner or element of the kitchen. 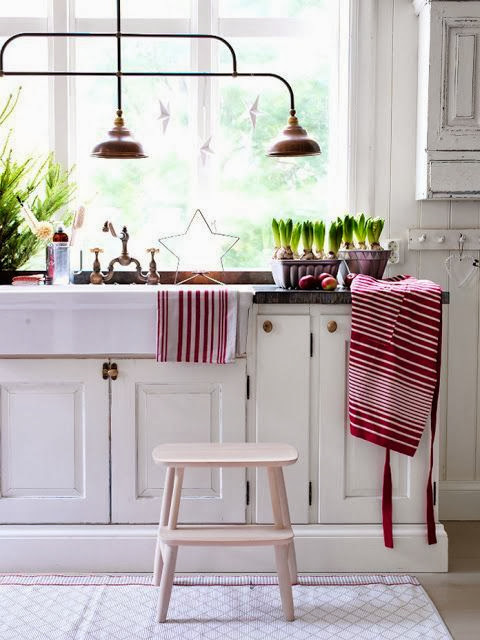 To help, we’ve gathered a list of beautiful kitchen decoration ideas for you. Have a look! As you can see, the kitchen in this picture is quite dressy in itself. So the decoration in kept minimal, with just pillar candles. What’s Christmas without a mug of hot cocoa? 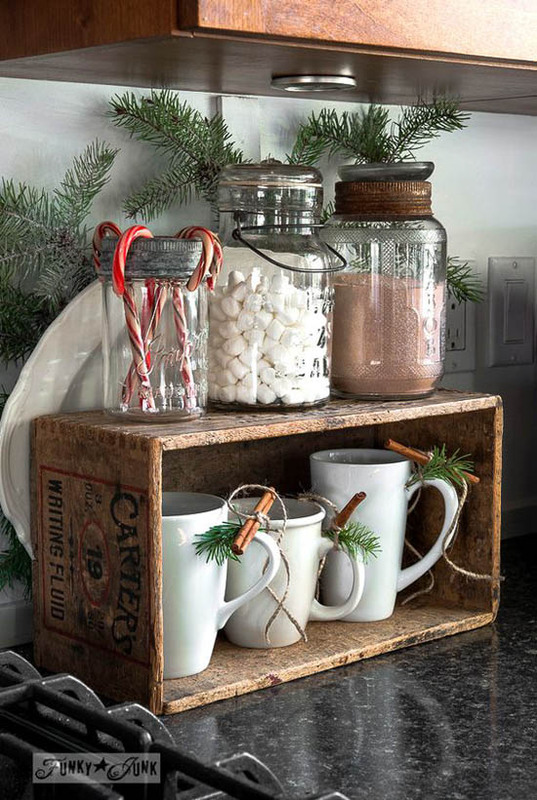 Now that you are going to arrange for a hot cocoa corner anyway, why not deck it up a bit as well. See the picture for reference. What we love the most about this Christmas tree is the whimsical ornaments used for its decoration. Place the tree at the corner of your tree. 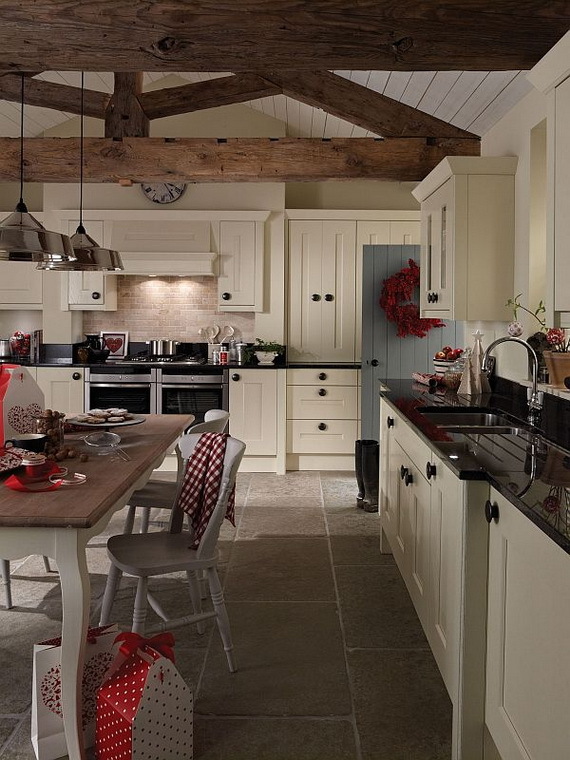 No matter how forward we move with time, a traditional Christmas kitchen has a charm of its own, as exemplified by this picture. 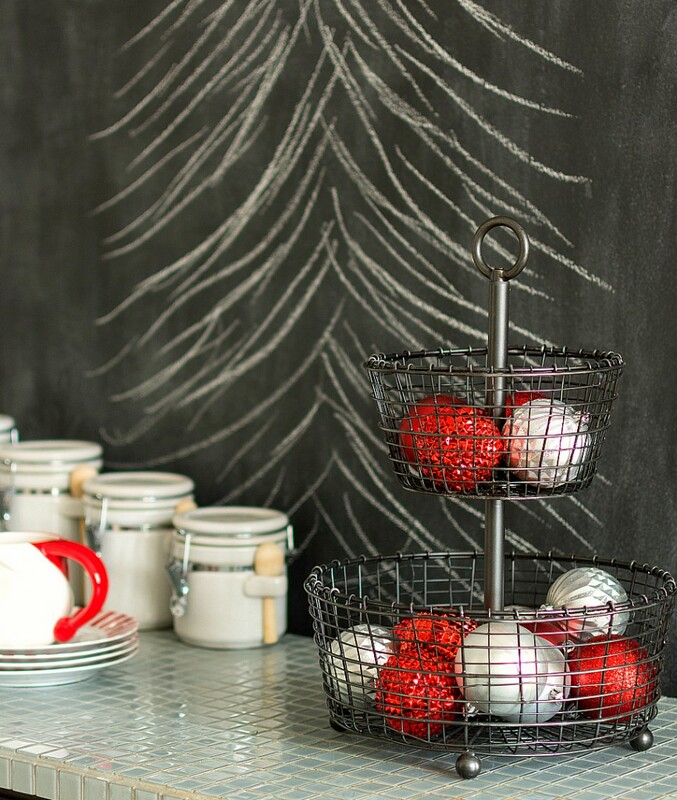 Here’s a perfect example of staying close to your roots while decorating the house. Old and even new elements are used for decoration. 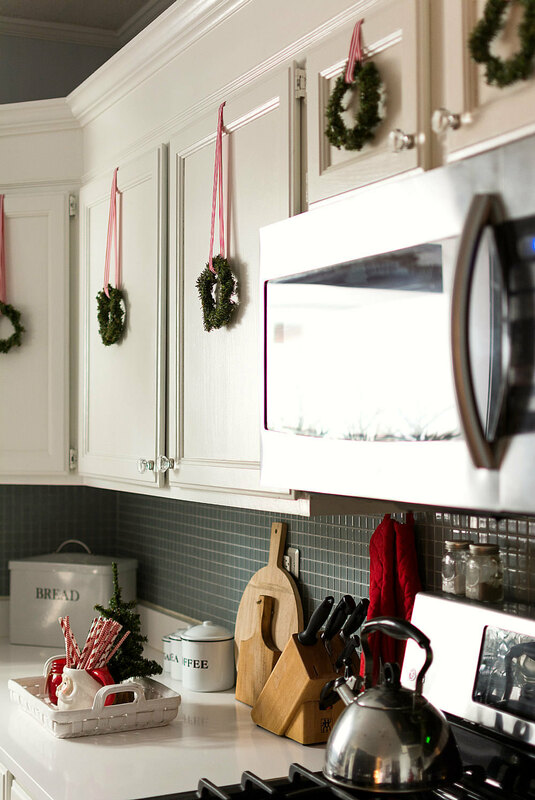 These incredibly cute wreaths will spread festive cheer in your kitchen and will get you all buck up for the feast without looking over the top. Little things go a long way in changing the face of the décor. See the picture, for instance. 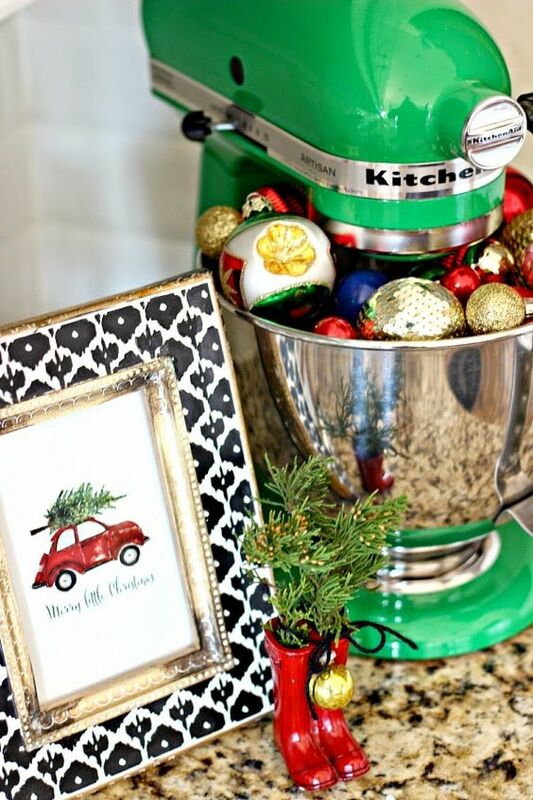 A mixing machine is filled with ornaments. And the little boots are looking adorable. The blogger from rosyscription.com created the Marquee JOY letters just to decorate her super spacious kitchen. The cute kitchen has taken our heart away. The color combination is super cute, and even the decoration is heart rendering. 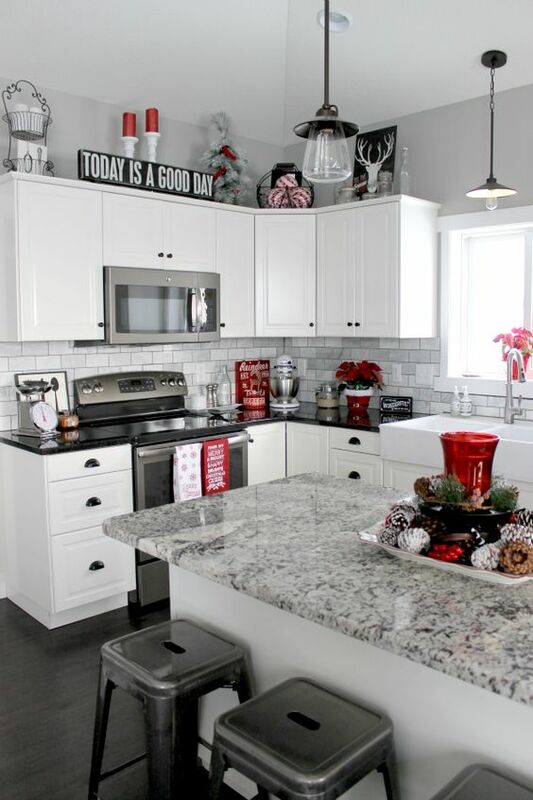 The white kitchen in this picture is decorated in the most minimal way possible. As you can see, just a wreath with green bow hangs from the window. Rest, everything is just arranged neatly. Embellish your kitchen with these pretty plates to create a vintage vibe in your kitchen. You need to be quite cautious in your plate selection. Another easy peasy way to dress up the kitchen cabinet. 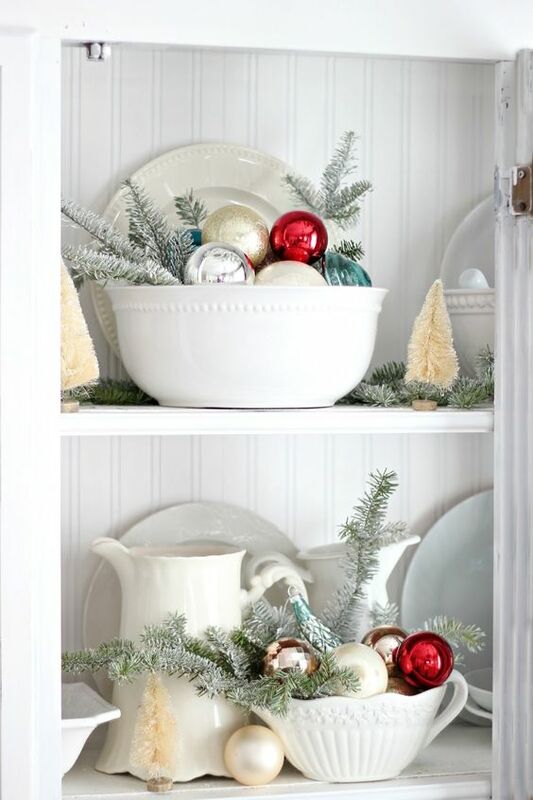 Fill bowls with colorful ornaments and place tiny bit elements along with it like a bottlebrush tree. 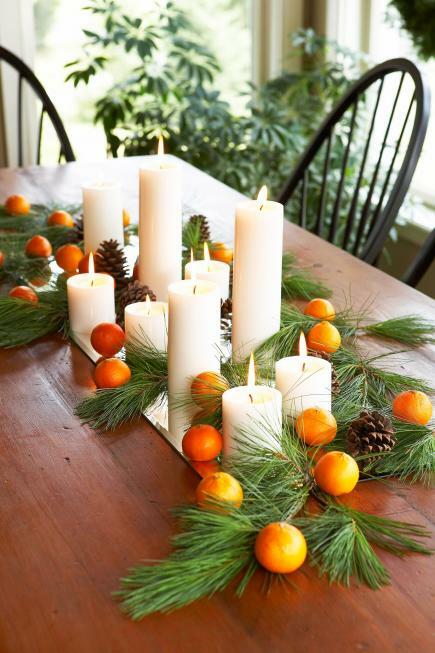 Replace the fruits and vegetables with merry and bright ornaments in the basket for a quick decoration. 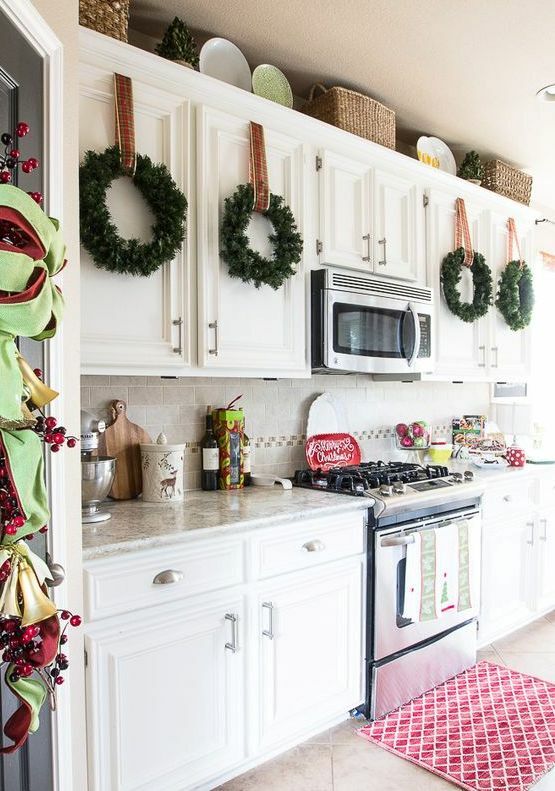 This kitchen drenches in Christmas joy. 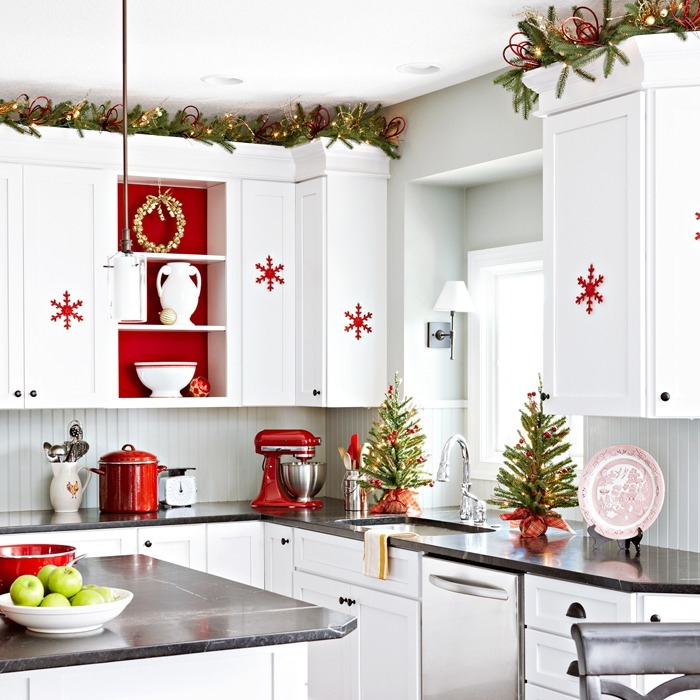 Red snowflakes are hung on the cabinet doors, and a pair of tiny Christmas trees are placed near the sink. Beautiful! This is such a fun and playful kitchen décor. We loved the usage of stools and tables in place of a proper dining room. And the color combination is chosen to keep the festival in mind. If you can spot some alphabet cookie cutters in the market, purchase a few to decorate the kitchen as well. 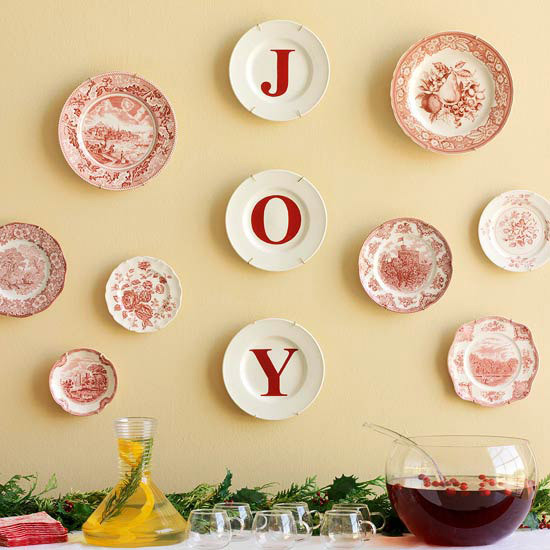 You can use the letters for creating signs on the mantel, shelf or entryway. 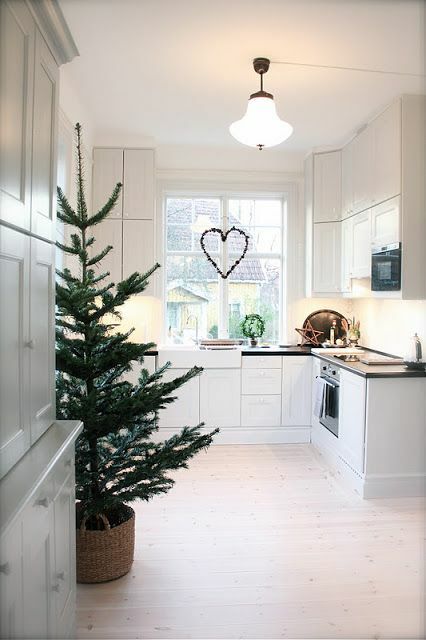 To keep things simple and straightforward, decorate the kitchen with a non-decorated Christmas tree. The heart shaped wreath is also looking adorable. 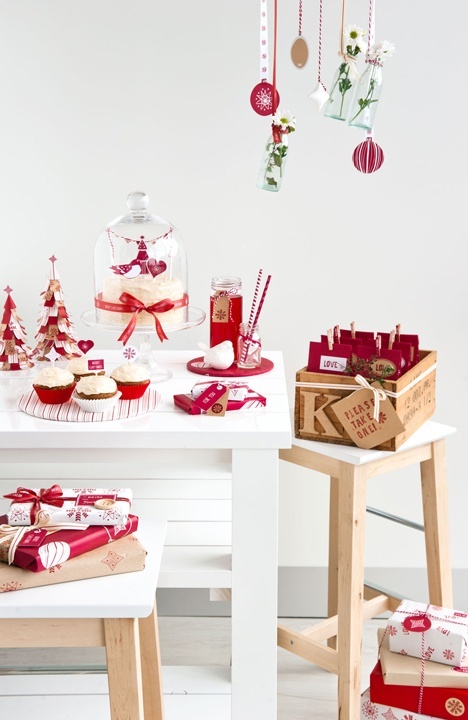 These adorable Santa chair covers will brighten the atmosphere like no other thing. And the red bows are also adding a pop of color. 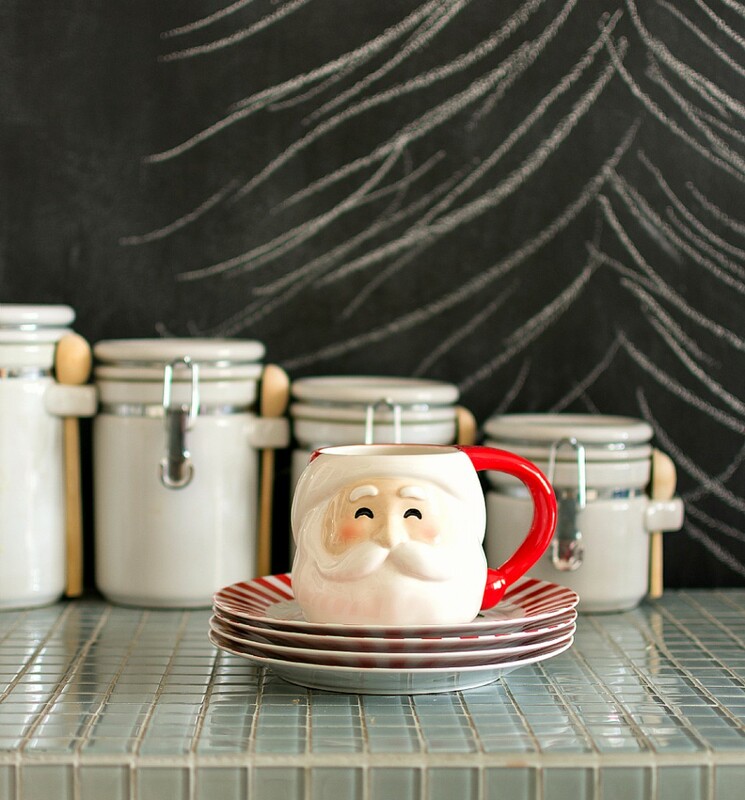 Place a Santa mug on the kitchen counter and see the excitement of children increase manifold. You can use the mug for putting candy canes. 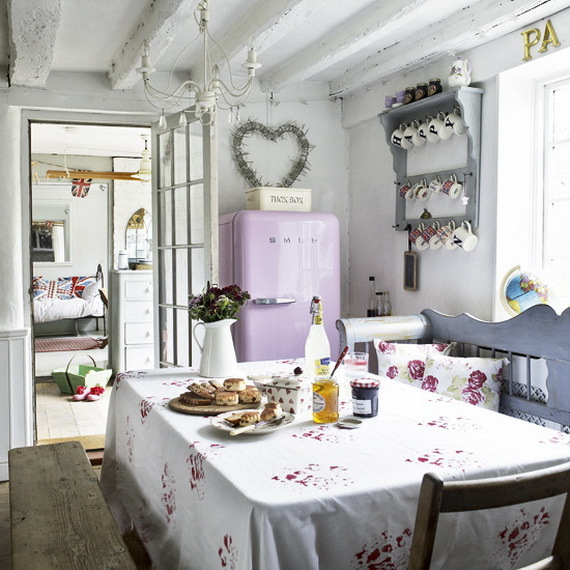 Not just the decoration, even the foods are served in a vintage way in this kitchen. And we can’t decide what we like more, the old fashioned fridge or its pastel color. 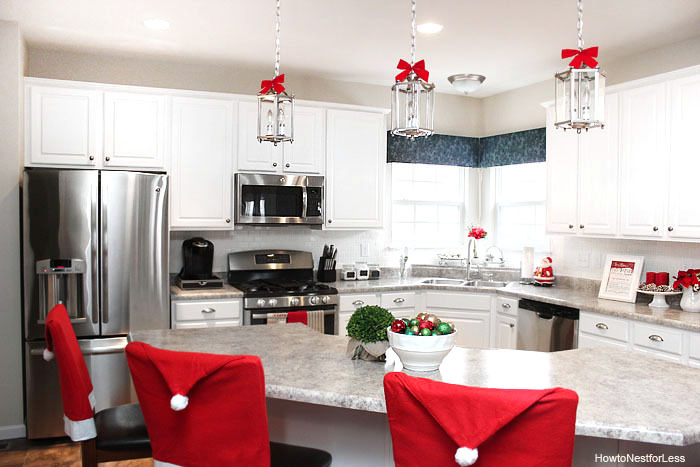 By just switching the texture of the kitchen to red or green and red, you can bring a sea of change to the Christmas décor. If there’s one shade that goes extremely well with white and gray, it’s gray. This kitchen had white and gray already. 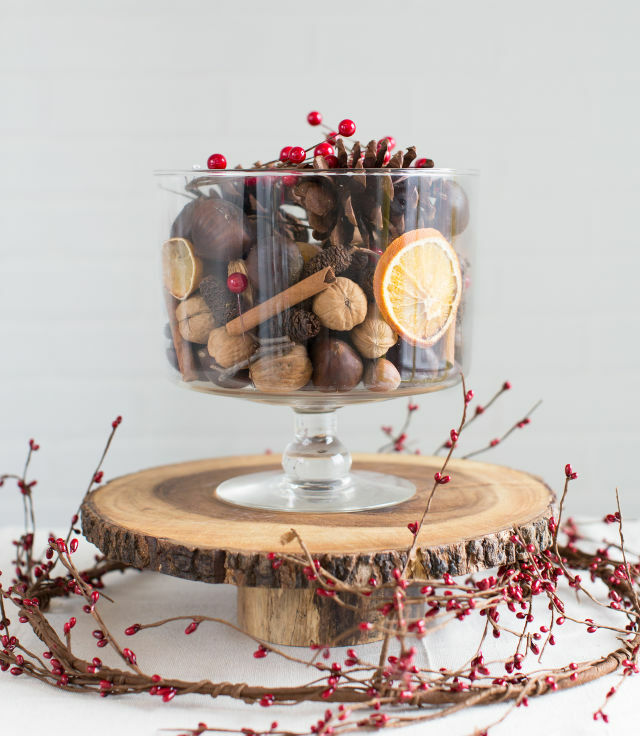 The blogger added hints of red to give a festive feel. 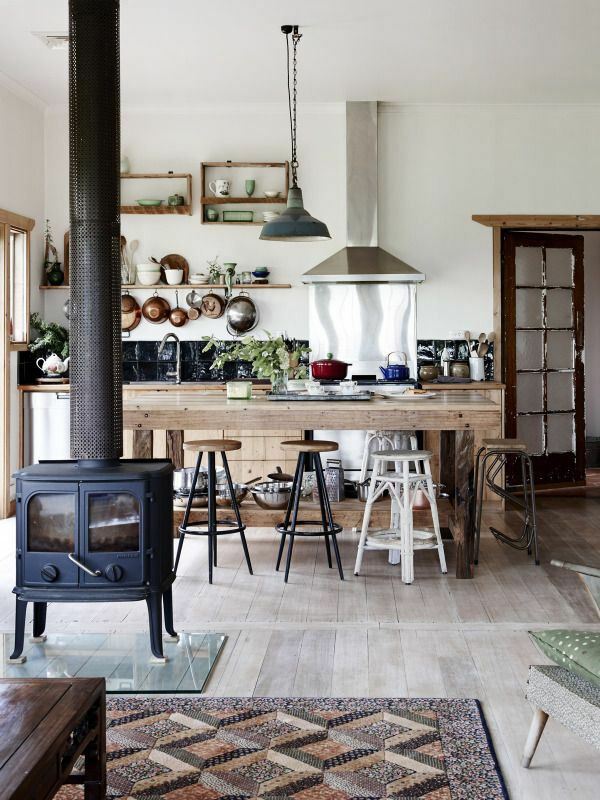 If you’re undecided between rustic and modern, you can opt for something in between, like you see in the picture. A large sized Christmas tree isn’t only for the living room. 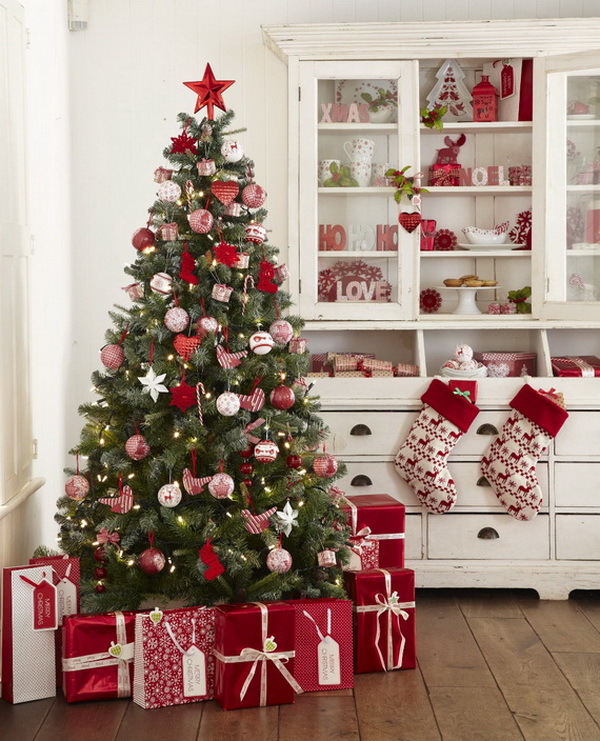 It your house boasts of a spacious kitchen, you can place a Christmas tree surrounded by gifts there itself. We loved the color combination too. Here’s another minimalistic decoration idea for the kitchen. Only a red wreath hangs from the kitchen door, and a few red elements are also thrown here and there. 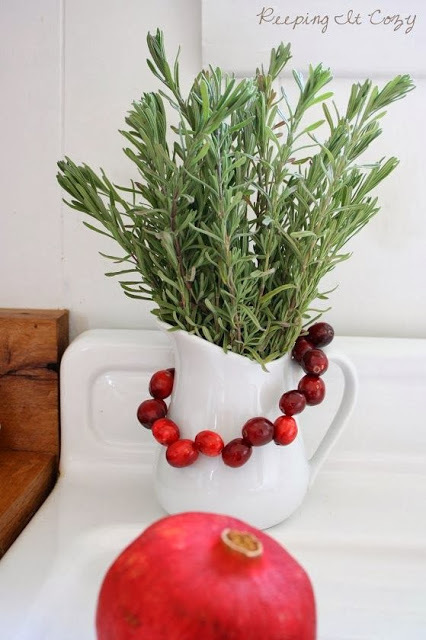 On the kitchen counter, place a ceramic pitcher filled with rosemary and dressed with cranberry candle. 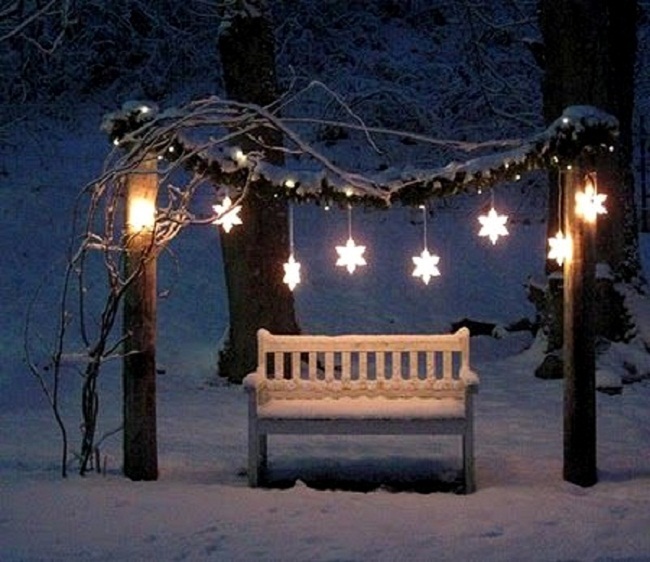 It will exude a wintry feel. Here’s a perfect idea for people who have super tiny kitchen. 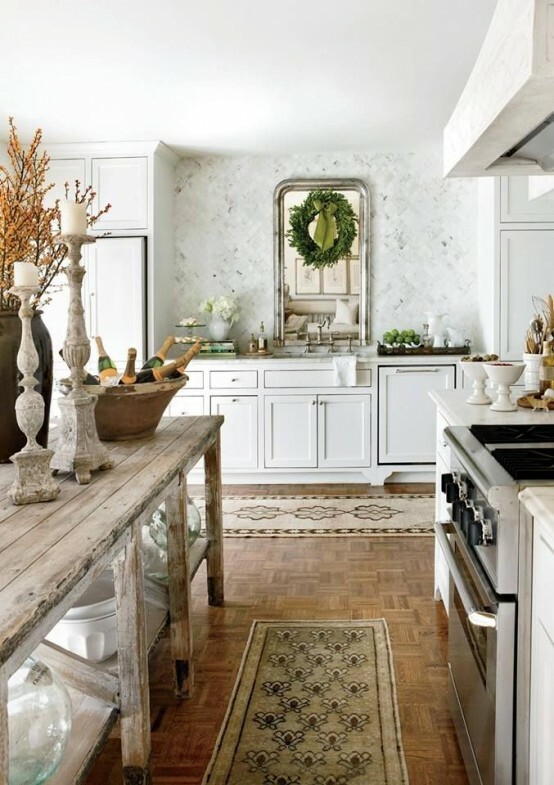 The kitchen here is decorated in such a neat way that it doesn’t appear too much in the face. 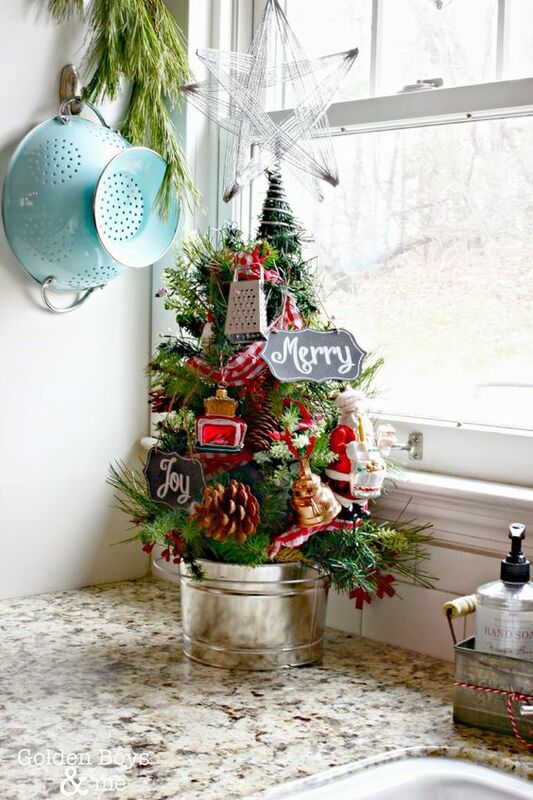 Place bucket trees decorated with ornaments to give a festive makeover to the kitchen do not forget to change the color of textile to red. 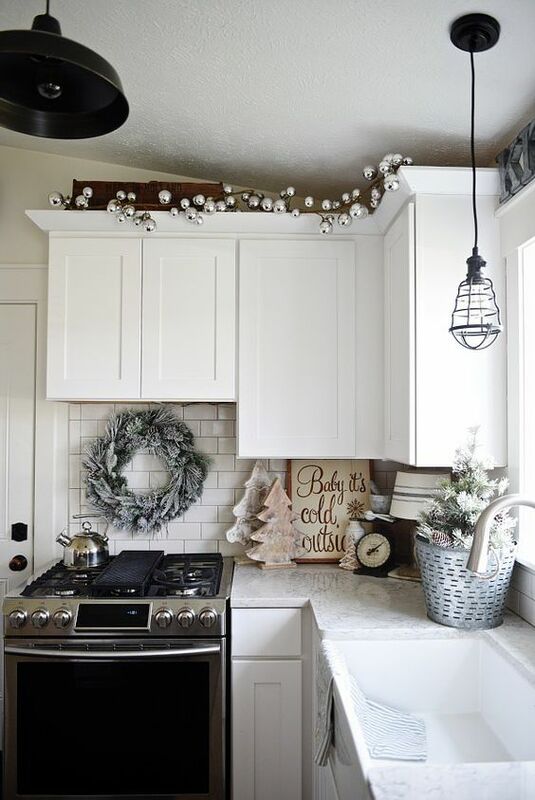 You can also hang wreaths from all the kitchen cabinet doors to spread the feelings of festivity. 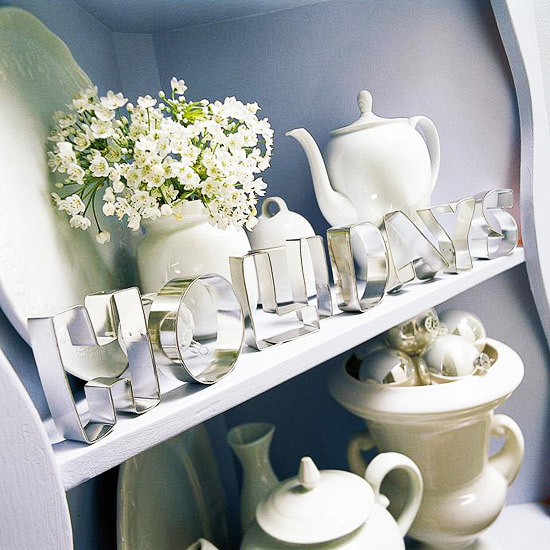 This kitchen shelf decoration idea is sure to fill the space with joy. These alphabet plates are easily available both online and offline. But you can even try making it yourself.